Arriving at the day’s site by snowmobile, Mike Dempsey and the Rangers dug out the snow, drilled through the sea ice, and lowered oceanographic instruments into the Arctic Ocean. The wintertime data, collected once or twice per season in locations up to several days along circuitous routes from a handful of Nunavut communities, is information only a decade ago oceanographers never had. CROW – Canadian Rangers Ocean Watch – came about by a fortuitous partnership between the Canadian government departments National Defense (DND) and Fisheries and Oceans (DFO), and it began with two men waiting for a plane for home. In 2009, Eddy Carmack and Mike Dempsey sat in the Yellowknife airport wondering at better ways to get the type of data they had just collected. From Victoria, British Columbia, they had flown to Yellowknife, Yukon, then northeast to Resolute, Nunavut, and finally using a 19-passenger Twin Otter aircraft they hopped between sites, when the weather allowed, to collect oceanographic data in the wintertime Arctic Ocean. “It got started in Cambridge Bay,” says Carmack, who was the lead scientist when CROW began, “because about that time they were talking about the new Canadian High Arctic Research Station [scheduled to officially open October 2017].” From the centre of the Canadian Arctic archipelago in the east to the Mackenzie Delta in the west, CROW expeditions have been led from Cambridge Bay, Kugluktuk, Gjoa Haven, and Taloyoak, in the Kitikmeot Region of Nunavut, and Tuktoyaktuk, Ulakhaktok and Paulatuk in the Northwest Territories. Rangers are trained on the use of the science kits that Dempsey assembled. Then they, and sometimes a researcher or technician from DFO, go out for up to a week, taking measurements at locations the group agreed on beforehand. “In the communities, the Canadian Rangers have a special place. This is one of the institutional structures in small communities. They do search and rescue. They do the northern warning system patrols. They do sovereignty patrols. They train the regular forces in winter travel and survival. In some communities there are Junior Canadian Rangers, which function as a cross between Scouts and Guides and Cadets.” And, for the last eight years, they have been collecting oceanographic data that scientists would not otherwise have. There are four science kits currently in northern communities. Each contains an RBRconcerto CTD, a Turner Cyclops fluorometer, and a Rinko dissolved oxygen sensor. 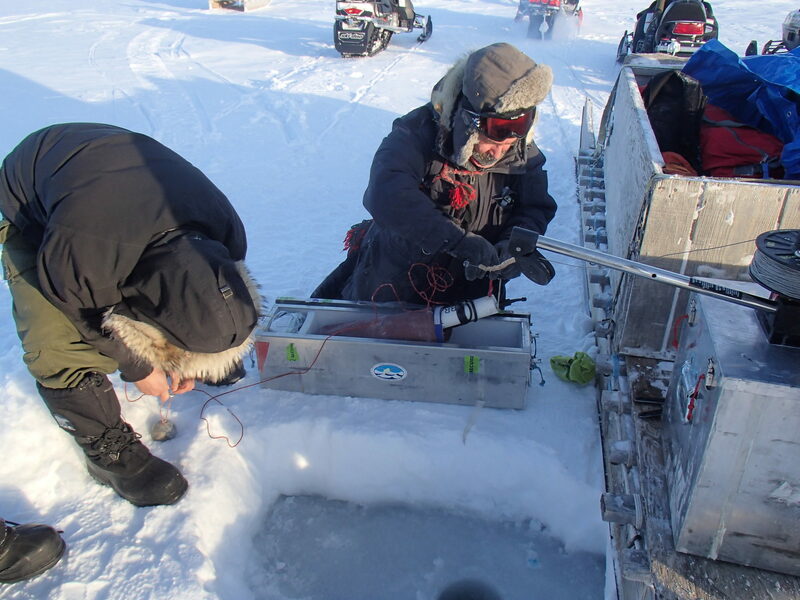 Dempsey says the RBR instrument was chosen because the conductivity sensor does not rely on pumped flow; because of its slim profile so drilled holes can be small; and, as Carmack says, “it is robust and well-suited for Arctic conditions.” Also part of the kit is an 8-inch ice auger; satellite telemetered temperature buoys, each connected to a thermistor string for measuring freeze-up and thaw timing; a folding zooplankton net; and water sample supplies. Their latest solution, satisfactory to Dempsey, is to keep the RBRconcerto in an insulated bag (sewn by a DFO team member) that then goes into an insulated aluminum box, and along with the CTD in the bag go four chemical hand warmers. “I buy hundreds of those every year. The hand warmers are cheap, simple, readily available, easy to ship, not dangerous goods, and, used as directed, they work.” They keep the temperature inside the bag to 8 or 9 degrees Celsius for 8 to 10 hours. The catch is keeping the hand warmers warm, because they generate water vapor in the heat reaction and can freeze up themselves. In Reflections of Canada, a book concerning research opportunities at Canada’s 150th anniversary, 2017, Carmack writes persuasively about continuing Arctic Ocean research, and lays out these facts defining the uniqueness of the region: the Arctic Ocean is the smallest of the Earth’s five divisions of the global ocean; it makes up just 1% of the world’s ocean volume, and just 3% of the world’s ocean surface area, yet twenty of the hundred longest rivers in the world drain into it – the Arctic Ocean accommodates 10% of global river runoff; and that fate of geography sets the conditions that allow ice to cover its surface. Williams explains that the northward-flowing Atlantic water “has enough heat to melt the sea ice continuously, but it’s not at the surface because of the freshwater that overlies it.” It’s largely because of Arctic river inflow that the Atlantic water sits at about 400 m. Consequently, the surface fresh layer is a barrier between the warm salty water and the ice. “One of the things that began our study of the region is that when you look down using visible satellite images, you see there are places where the ice melts earlier than everywhere else, narrow channels or straits, gaps between islands. The ice is thinner there. When we see that we think that looks like tidal mixing bringing warm water in and causing mixing and the ice to melt earlier.” These are places, Williams explains, where mixing brings nutrients to the surface and enhances the productivity. Williams would like to expand DFO’s relationship with the Rangers, to do more regular sampling. He notes there are environmental technology programs in the north that are training people to do the type of ocean sampling CROW has been conducting. But really, Carmack’s view is much longer. He has a vision of ocean monitoring by locals of their own waters in a globally connected network that is what he calls, an antenna for climate change. For the North, his hope is that projects like CROW will become part of their oral tradition.